My kids and I LOVE BROWNIES and RED VELVET CAKE so with this…you can have the best of both world. 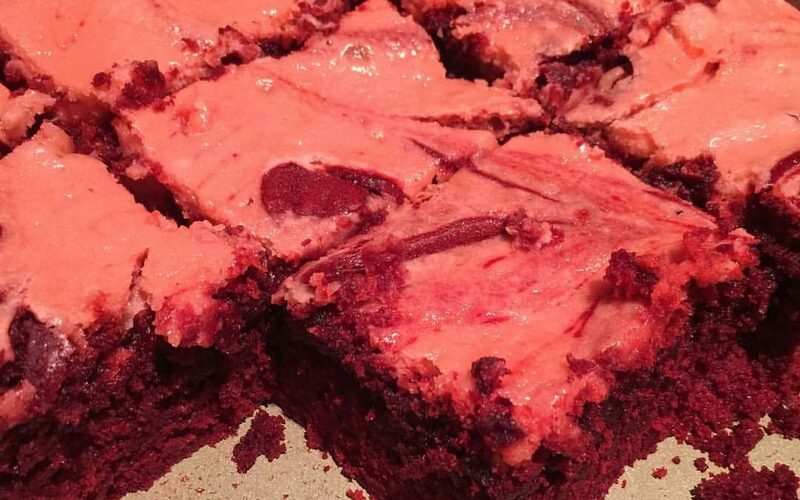 But honestly…I don’t always have time to make them from scratch so this is my go to red velvet brownies. These little pillow of goodness are heavenly. 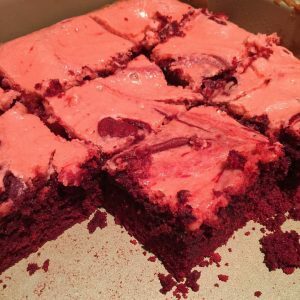 They are so rich and moist….these are my cheat red velvet brownies!!! Grease/spray an 8×8 inch baking dish. Set aside. In a mixing bowl, combine cake mix, butter, 1 egg and water with an electric mixer. Spread mixture into prepared baking dish. In another bowl, combine cream cheese, 1 egg, sugar and vanilla extract with electric mixer (medium setting). Once the cream cheese mixture is incorporated …drop heaping spoonfuls of cream cheese mixture on top of the brownie base. Using a sharp knife, swirl the cream cheese throughout the brownie mixture. Bake 30 to 35 minutes or until lightly browned on the edges and center isn’t too wobbly. Remove from oven and cool for at least 30 minutes before refrigerating. Refrigerate at least 2 hours before slicing and serving. The trick to slicing brownies is use a PLASTIC KNIFE!! SIDE NOTE: My cream cheese mixture turned out a light red color after baking.